Hope that all are having a great Labor Day holiday, or Monday, wherever you are! I was really looking forward to a lovely rainy day here in Houston, but unfortunately the rain hasn’t arrived yet and it’s just hot and humid. Oh well, any time is a good time for a pipe, and today I want to share with you my impressions of two good dogs - John Bull Royal English and Junkyard Dawg. Cornell & Diehl’s Junkyard Dawg is C&D’s take on the American classic Barking Dog. The blend is made up of burley, latakia, and virginia and omits Barking Dog’s touch of perique. The mournful boxer on Barking Dog’s label has been replaced with a snarling, cigar chomping bulldog. Don’t let him frighten you off, though! Upon opening the tin you’re greeted with a lovely coarse leaf in various shades of brown. The tin note leans heavily towards the smokey brisket scent of latakia, and no hint, at least to me, of a topping or any kind of flavoring. The Mrs. gave it a whiff and immediately declared it to be an outside blend. This tobacco loads, lights, and burns with no issues at all. Junkyard Dawg is quality tobacco all the way, and has a very rich American English flavor. This dawg plays a bit rougher than Barking Dog, and can get a little bitey if you’re not careful with your cadence. It’s also a strong one, both in potency and aroma. If you’re not used to a good dose of nicotine, rolling with the dawg will leave your head swimming! The room note and aroma linger, so everyone you encounter will definitely know you’ve been in the doghouse! The other dog in this fight is STG/Lane Ltd.’s John Bull Royal English, represented by a very Churchillian bulldog on the pouch. This blend contains virginia, burley, black cavendish, and latakia tobaccos. The pouch note is, like Junkyard Dawg, tobacco forward with no detectable flavorings or toppings. The smokiness is dialed down a notch though and there is a hint of sweetness from the black cavendish. The Mrs. also deemed John Bull to be an outside blend, but said that it’s not as offensive to her nose as Junkyard Dawg. Pulling a sample out of the pouch, the cut is finer and there are flecks of black cavendish among the various shades of brown. Like its competitor, John Bull loads and lights easily and burns with no problems at all, only requiring a couple of relights. This is a very smooth smoking tobacco and is thoroughly pleasant. The various varieties of leaf play well together and the black cavendish adds a bit of sweetness while smoothing out the experience without making the blend bland. The latakia stays with you until the end keeping up its part in the flavor spectrum. The nicotine strength is quite a bit lower than Junkyard Dawg’s and the room note is much more tolerable to passers-by! This was a fun matchup as we have two similar blends that differ mainly in the proportions of the component tobaccos and the inclusion of black cavendish in John Bull. Between the two I have to give the nod to John Bull in this matchup. STG/Lane’s bulldog is just a bit more polite that C&D’s Junkyard Dawg, and in my opinion beats the Dawg in the flavor department. However, if you’re looking for an American English blend that is strong , headstrong, and pulling at the leash, then definitely give Junkyard Dawg a home in your cellar! Bonus: Along with the Junkyard Dawg, I ordered a tin of C&D’s Epiphany from the good folks at www.smokingpipes.com . The basic ingredients are the same as Junkyard Dawg, though the proportions are different and a bit of perique is added. This is a much more well-behaved blend. Like its stablemate it loads and lights easily and only requires a couple of relights. It’s quite strong, to be sure, but it’s full of flavor with the perique popping in and out to give you nips of Louisiana pepper. I’ve never had the pleasure of trying the original Revelation, but I can see why this blend would be favored by a particular well-known physicist! Highly recommended! Happy Saturday Pipemen! The first week of school is over, as is a rather difficult Summer. Happily, my wife is now cancer free and the Summer cold that turned into bronchitis (and left me looking sadly at my pipes and unable to use them) is gone! Today I wanted to share with you my little collection of pipes. I have been fascinated with petrol lighters since childhood when I would happily spark my aunt and uncle’s Zippo and Ronson. I love my lighters and I hope you enjoy this post! First up is a pair of Zippos, on the right is my daily use pipe lighter purchased in 2017. On the left, is my trusty lighter that I bought the week I left home at eighteen in 1989. That Zippo and a swiss army knife saw me through my bachelors degree, working, then backpacking through Europe, returning to school and beginning my career, then living in Russia from 1997-2004, and back to the States again. I quit cigarettes in 2009, so It now enjoys a happy retirement cleaned up and with a place of honor on the shelf where my lighters live. By the way, the swiss army knife had to be replaced for everyday carry with a new one in 2015 when the red handles finally fell off. It lives in my tool box and still sees regular use. Here’s a Zippo Varga Girl lighter I received as a gift in the 90s. You’ve got to love Varga’s art! A pair of Zippo slims. On the right, a well-loved example that I found for a couple of bucks in a rummage bin. This lighter obviously got a lot of use and you can see where the hinge pin was replaced by the owner. On the left is a souvenir lighter from the ocean liner America. I also collect postcards from passenger ships 1900-1971. I believe I have cards for all of the liners and cargo liners of the United States lines so this was an exciting find for me. These are two Ronson standard lighters of different vintages. The one on the right is engraved with a serial number, but I can’t find anything that it might refer to. Any ideas pipemen? Here we have a Japanese made Craftsman Trilite and a Nimrod Admiral that I love using now and again! I keep hoping that I’ll finally come across a Nimrod Sportsman that I can afford! Here we have a pair of IMCO Austria lighters. On the right, a model 6600 Junior, and on the left, a model 6700 Super. IMCO lighters are absolutely terrific and deserve their good reputation. The 6700 is actually the second I’ve owned. The first took a fall from a 21st floor balcony where I had absconded from a party to smoke and flirt. In the light of day the lighter was found, and although dented a bit, snapped open firmly and burned bright. Unfortunately over the years and a few moves, that one disappeared. Wherever you are, keep burning brightly old friend. Here is a Regens side squeeze lighter. I wish I knew more about it, like the manufacture date. All the same, it is a really cool piece of American engineering! This is a bit of a mystery! Another rummage bin find, this well used, thin petrol lighter sparks and lights well. However there are no markings on it at all except for “Automatic First Quality Lighter” on the bottom. Although I’m mostly interested in petrol lighters, I do have two butane lighters that have found a home in my collection. On the left is Flamex Pipelighter. I just love the space age, mid-century look. It’s a mighty fine lighter too! On the right is a Chinese lighter with built in pipe tools. I like that it has pipe shapes stamped on both sides. This lighter is not part of my personal collection, but has a very special place in our home. 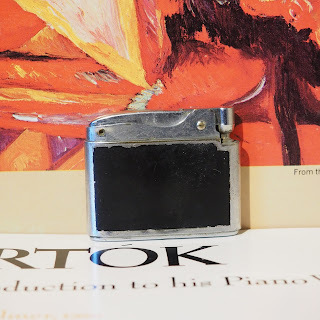 This Zippo pipe lighter was gifted to my wife’s grandfather, Grandad Damewood on the last Father’s Day that he was with us. Today this lighter, along with a portrait of him with his ever-present pipe stays on our bookshelf with other treasured family items. Well, that’s it for today Pipemen! What’s your favorite lighter? Until next time! Good morning, Gents! Today I’m writing about a relatively new discovery for me - Bob’s Chocolate Flake. Bob’s Chocolate Flake is produced in England by Gawith, Hoggarth and company. The flake itself is a blend of virginia, burley, and latakia with cocoa and vanilla flavorings added. It’s available in 50 gram tins from your favorite online retailer or B&M tobacconist. I first became acquainted with Bob’s Chocolate Flake when my May 2018 box from the Tin Society (www.tinsociety.com) arrived. The sample packet contained broken flakes of dark brown, lighter brown, and a few flecks of almost black tobacco. I opened it up and and was greeted with the scent of good quality tobacco with a whiff of latakia smokiness. Among the delicious tobacco scent was just a hint of cocoa. I passed it over to the Mrs. for the smell test and Bob’s was approved for indoor use - very unusual as blends with latakia are, with the exception of Lane’s HGL, relegated to the porch and garage (which reminds me - be on the lookout for my “Dogfight” review - Junkyard Dawg vs. John Bull - coming soon!). Puffing slowly, almost sipping, I got a delicious flavor of good tobacco and began to taste a little sweetness from the virginias on my lips. Suddenly, the terrific pipe tobacco flavor was replaced in my mouth with the creamy taste of cocoa and vanilla, almost like hot chocolate, but not the instant or Hershey’s flavored kind - think homemade hot cocoa made with cream, Dutch cocoa powder, vanilla, and a little sugar. The flavor was that good. The Mrs. got a similar feeling form the room note when she stepped out. The cocoa flavor receded and the tobacco flavor came to the fore again. The flavors slowly alternated as the bowl burned lower, fading into each other and becoming more concentrated as the bottom of the bowl approached and the tobacco combusted into fine grey-white ash, leaving no dottle behind other than a pleasant memory. The reliable Zippo pipe lighter didn’t get much of a workout with this bowl. I only had to relight it twice. Over the next few days I experimented a bit more with rubbing out and packing Bob’s Chocolate Flake and found that rubbing it out completely, letting it dry a bit, and packing it lightly gives the best results for me - your mileage may vary though. Interestingly, I’ve not picked up on the floral or Lakeland notes that some reviewers have mentioned. I’ve also not found any whisky flavor. That’s not to say that the floral and alcohol notes aren’t there, just that my sniffer and tastebuds aren’t picking up on them. I am now a true fan of BCF and am actively adding it to my cellar I would heartily encourage any piper to give this blend a try! On another note, Padre Piper’s (@PadrePiper) recent vlog on codger blends got me thinking - what are my top codger blends? I love the smell of cherry pipe tobacco, and at 47 I’m old enough to remember sitting in the stands at high school football games and catching whiffs of cherry tobacco in the Autumn air. My grandfather, L.J. James was also a cherry blend piper, so I have very happy memories there. Unfortunately I’ve never found a cherry blend that agrees with me. Until next time,. Keep the fires burning! Greetings gents! Hope all is well! With this post (which has been waiting patiently in my drive for some time) I’m starting to get caught up after a hectic 2nd semester! Be on the lookout for fresh posts soon! Here are two more gems from the estate lot box – an unmarked vest pocket pipe, and a sitter simply stamped “Imported Briar.” The vest pocket briar is a bit of a mystery, but I believe the sitter is one of the Dr. Grabow Continental line of pipes that was produced for a time in the early 60s. Based on what I’ve seen online, I think this example has a replacement stem. In the near future I will have to bend the stem into the correct configuration for this model. Other than a cobweb in the chamber of the sitter, both pipes were exceptionally clean! First, I dropped the stems into a warm oxyclean solution to loosen up any grime. The VPP was very clean and the sitter’s stem had just a bit of oxidation and mineral deposits. While the stems were in the bath, I cleared the airways of the stummels of just a bit of goop and gave the stummels a scrubbing with Murphy’s oil soap and a soft toothbrush. I touched up a nick on the surface of the VPP then gave both stummels a coat of oil and left them to soak it in. The stems were a very easy job. The VPP’s stem was almost immaculate and just needed a bit of polishing. The stem of the sitter required a little elbow grease to remove the light oxidation and mineral deposits. The airways of each needed just a little attention and a couple of pipe cleaners to bring them up to spec. After a couple of rounds on the buffer, both pipes were shined up and ready to go! I’ll be holding onto these two and I imagine that the vest pocket briar will come in very handy and see some good use during the holiday season as we go to visit various relations! Until next time, keep the fires lit, pipemen! Greetings Pipemen! Today I have another repair from the estate box of briars. Man, is this thing big! The Mrs. imagines that this was a sailor’s pipe. He didn’t have time to reload very often, hence the huge bowl. He apparently didn’t have the time to clean it either - this pipe was filthy! The stummel was smokey and sticky and very little grain was visible through the grime. There were also some flecks of green paint on one side. The rim was encrusted and the chamber was incredibly caked up, as you can see in the photo. The oxidized stem, once I was able to free it, I found was quite plugged up. The stem went into a warm solution of Oxyclean while I got to work on the stummel. The first order of business was to clean out the chamber. Once the first layer of cake (and wow, was this stuff sticky! I wonder what the previous owner smoked.) had been removed, I found that my reamer wasn’t able to reach the sides of the chamber. After some elbow grease, a dowel, sandpaper, and lots of time, the chamber was clear - you can see how much goop came out in the photo. Next stop, the airway, which was completely plugged. Between a small, hand-turned drill bit, and lots of cotton swabs and pipe cleaners, the airway was finally free. Next, the stummel got a scrubbing with a soft toothbrush and Murphy’s Oil Soap. After a couple of rounds, I could see the true form of this briar emerging from under the grunge. Happily the paint flecks came right off with a little help from my thumbnail. I rinsed and dried the stummel then headed back out to the workshop. With a light sanding of the rim, a few scorch marks were removed then I touched up the finish, oiled the stummel and set it aside to tackle the stem. Cleaning the airway took time, patience, and lots of pipe cleaners. With that accomplished I began sanding and polishing the stem to remove the oxidation and some mineral deposits. I decided to revisit a couple tooth marks later. WIth the pipe cleaned and reassembled, I gave the works a once over with white diamond, then two coats of carnauba. As I was working the pipe on the buffer I could see the beautiful grain of the briar. This really is a lovely pipe and is ready to be put back into service in my collection! Thanks for reading, and until next time, keep the fires lit, pipemen! Greetings Pipemen! I hope this post finds you all well! I found this little owl-shaped meer on ebay and put in a bid. Happily mine won and soon the pipe was on its way to Texas. Upon unpacking, I had a close look at the stummel and found it to be quite dry, a little dirty, and mostly off-white with some patches of color here and there. I also found a sticky layer of cake buildup in the chamber. After removing the stem, my first order of business was to clean the chamber. I gave it a gentle sanding with 200 grit sandpaper wrapped around a marker. Not wanting to damage the material of the pipe, I sanded it down to where I could see the stone peeking through a light layer of carbon. Happily, I was able to get all of the sticky stuff out. When I removed the stem I did come across a bit of a mystery - a paper cylinder sleeve covering part of the airway. I cannot find ANY info about this thing other than another reference online to finding one in another meer. Does anyone know what the proper name of this sleeve is and where I can get a replacement? The one that came with the pipe has seen better days and may not hold out much longer. After cleaning the chamber, I gave the airway a cleaning. It was in pretty good condition and only needed a few pipe cleaners to be brought up to ship shape. Afterwards, I brushed the surface of the pipe with a soft toothbrush. I then used a pick to dislodge a few pieces of gunk stuck in the nooks and crannies of the carvings. Following the cleaning, I put on some 100% beeswax to melt while I gently heated the pipe with a hair dryer. Once the wax was completely melted, I used a paintbrush to apply the wax to the entire surface, making sure to get it into every crevice. I let the wax settle in a bit then heated the stummel with the hairdryer again. Almost all of the wax absorbed - this little meer was thirsty! I repeated the waxing process then let the stummel sit and rest while I cleaned and polished the stem. The stem’s airway was pretty clean already, and again it only took a few pipe cleaners to get it squared away. I cleaned and polished the surface of the stem then gave it a couple of coats of carnauba. After its cleaning and waxing this little meer looks much better! The wax has drawn more of the color to the surface and over time this should darken to a lovely mahogany hue! I’m looking forward to having this meer in my rotation! I recently won a box lot of briars on ebay and the postman delivered them this weekend! 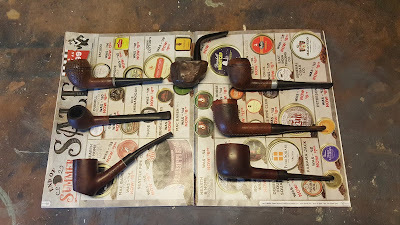 They are in various states of repair, but all are quite mendable and I'm looking forward to sharing my repairs with all of you as I bring these veterans back into smoking condition! I'm really excited about the large pot briar - it's going to be a challenge to recondition but I think it will be a great smoker! From the size of the bowl, I'm guessing it will give a good 1 - 1.5 hours. I've also recently received a shipment of Ratttray's Bagpiper's Dream and Sutliff's Maple Street. I'll be posting my thoughts on them soon. Until next time, keep the briars lit, pipemen! Teacher, musician, art lover, and pipe enthusiast. I'm a native of Houston, and have also lived in California and overseas - including over seven years in Moscow, Russia. I teach Social Studies at a high school in Houston.